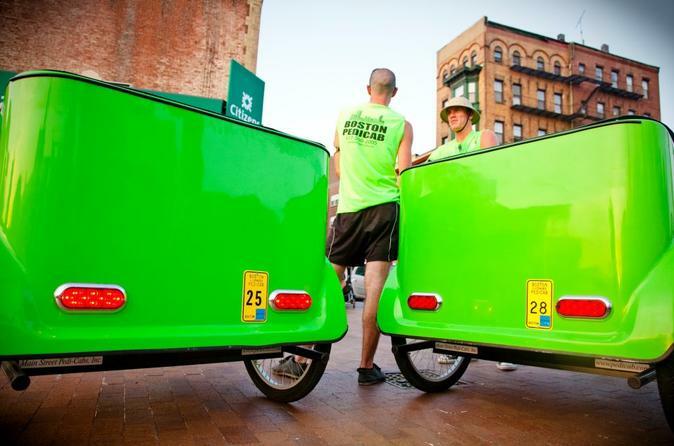 Explore the Back Bay from the back of a pedicab! A pedicab is a bicycle powered taxi and if you haven’t tried riding on one yet, you are in for a treat. Fully open-air, you get 360 degree views of the city as you whiz around through Boston’s streets. Pedicabs can get where cars and tour busses cannot so you can get up close to see the exquisite details of the city’s monuments and architecture. The experience of riding a pedicab is only surpassed by the quality of our drivers who will give you the history of the sites you are viewing from a local perspective and insider recommendations for your visit. One of the best parts of our tours is the flexibility. We can start and finish whenever and wherever you want. We can customize your route and stop anywhere you want for pictures or a snack like a "lobstah roll" or "cuppa clam chowdah". It is entirely up to you! (Price may vary based on tour length). Please feel free to include any special requests when booking. We look forward to being the highlight of your visit!